↑ ၅.၀ ၅.၁ Planck Collaboration (2015). "Planck 2015 results. XIII. Cosmological parameters (See Table 4 on page 31 of pfd).". ↑ "The Temperature of the Cosmic Microwave Background" (December 2009). The Astrophysical Journal 707 (2): 916–920. doi:10.1088/0004-637X/707/2/916. Bibcode: 2009ApJ...707..916F. ↑ Christopher J. Conselice et al (2016). "The Evolution of Galaxy Number Density at z < 8 and its Implications". The Astrophysical Journal 830 (2). doi:10.3847/0004-637X/830/2/83. ↑ Gott III, J. Richard (2005). 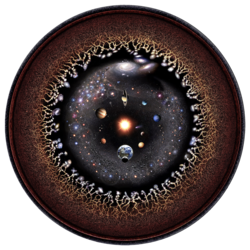 "A Map of the Universe". The Astrophysics Journal 624 (2). doi:10.1086/428890. Bibcode: 2005ApJ...624..463G. ↑ Frequently Asked Questions in Cosmology. Astro.ucla.edu. Retrieved on 2011-05-01. ↑ Krauss, Lawrence M. (2007). "The Return of a Static Universe and the End of Cosmology". General Relativity and Gravitation 39 (10): 1545–1550. doi:10.1007/s10714-007-0472-9. Bibcode: 2007GReGr..39.1545K. ↑ Using Tiny Particles To Answer Giant Questions. Science Friday, 3 Apr 2009. According to the transcript, Brian Greene makes the comment "And actually, in the far future, everything we now see, except for our local galaxy and a region of galaxies will have disappeared. The entire universe will disappear before our very eyes, and it's one of my arguments for actually funding cosmology. We've got to do it while we have a chance." ↑ van Dokkum, Pieter G. (2010). "A substantial population of low-mass stars in luminous elliptical galaxies". Nature 468 (7326): 940–942. doi:10.1038/nature09578. PMID 21124316. Bibcode: 2010Natur.468..940V. 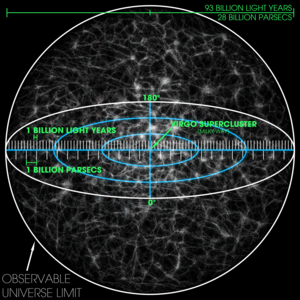 ↑ "Hubble Goes to the eXtreme to Assemble Farthest Ever View of the Universe" (Press release). 25 September 2012. Retrieved 1 July 2013. ↑ New Gamma-Ray Burst Smashes Cosmic Distance Record – NASA Science. Science.nasa.gov. Retrieved on 2011-05-01. ↑ More Observations of GRB 090423, the Most Distant Known Object in the Universe. Universetoday.com (2009-10-28). Retrieved on 2011-05-01. ↑ Meszaros, Attila (2009). "Impact on cosmology of the celestial anisotropy of the short gamma-ray bursts". Baltic Astronomy 18: 293–296. Bibcode: 2009BaltA..18..293M. ↑ Hubble and Keck team up to find farthest known galaxy in the Universe|Press Releases|ESA/Hubble. Spacetelescope.org (2004-02-15). Retrieved on 2011-05-01. ↑ MSNBC: "Galaxy ranks as most distant object in cosmos"
The Universe Within 14 Billion Light Years – NASA Atlas of the Universe – Note, this map only gives a rough cosmographical estimate of the expected distribution of superclusters within the observable universe; very little actual mapping has been done beyond a distance of one billion light years.